There is always something special about science meetings. 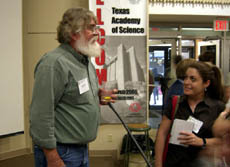 The 109th meeting of the Texas Academy of Science at Lamar University in Beaumont on 3-5 March 2006 was especially exciting for me, because a student and his professor presented the results of a DNA study I suggested to them last year. How fulfilling to see the baldcypress ( Taxodium distichum ) leaves we collected last summer and my tree ring photographs transformed into a first class scientific presentation that's nearly ready to submit to a scientific journal (Brian Iken and Dr. Deanna McCullough, "Bald Cypress of the Texas Hill Country: Taxonomically Unique?" 109th Meeting of the Texas Academy of Science Program and Abstracts [ PDF ], Poster P59, p. 84, 2006). But there was a gravely disturbing side to that otherwise scientifically significant meeting, for I watched in amazement as a few hundred members of the Texas Academy of Science rose to their feet and gave a standing ovation to a speech that enthusiastically advocated the elimination of 90 percent of Earth's population by airborne Ebola. The speech was given by Dr. Eric R. Pianka (Fig. 1), the University of Texas evolutionary ecologist and lizard expert who the Academy named the 2006 Distinguished Texas Scientist. This curious incident came to mind a few minutes later when Professor Pianka began his speech by explaining that the general public is not yet ready to hear what he was about to tell us. Because of many years of experience as a writer and editor, Pianka's strange introduction and the TV camera incident raised a red flag in my mind. Suddenly I forgot that I was a member of the Texas Academy of Science and chairman of its Environmental Science Section. Instead, I grabbed a notepad so I could take on the role of science reporter. Pianka then began laying out his concerns about how human overpopulation is ruining the Earth. He presented a doomsday scenario in which he claimed that the sharp increase in human population since the beginning of the industrial age is devastating the planet. He warned that quick steps must be taken to restore the planet before it's too late. He then showed solutions for reducing the world's population in the form of a slide depicting the Four Horsemen of the Apocalypse. War and famine would not do, he explained. Instead, disease offered the most efficient and fastest way to kill the billions that must soon die if the population crisis is to be solved. After noting that the audience did not represent the general population, a questioner asked, "What kind of reception have you received as you have presented these ideas to other audiences that are not representative of us?" Pianka responded to more questions by condemning politicians in general and Al Gore by name, because they do not address the population problem and "...because they deceive the public in every way they can to stay in power." The 45-minute lecture before the Texas Academy of Science converted a university biology senior into a Pianka disciple, who then published a blog that seriously supports Pianka's mass death wish. Let me now remove my reporter's hat for a moment and tell you what I think. We live in dangerous times. The national security of many countries is at risk. Science has become tainted by highly publicized cases of misconduct and fraud. Forrest M. Mims III is Chairman of the Environmental Science Section of the Texas Academy of Science, and the editor of The Citizen Scientist. He and his science are featured online at www.forrestmims.org and www.sunandsky.org. The views expressed herein are his own and do not represent the official views of the Texas Academy of Science or the Society for Amateur Scientists. Figure 1. Dr. Eric R. Pianka and an unidentified woman from the University of Texas at Arlington following a recent speech before the Texas Academy of Science in which Pianka endorsed airborne Ebola as an efficient means for eliminating 90 percent of the world's population. Pianka received an enthusiastic and prolonged standing ovation. Later he received more applause from a banquet hall filled with more than 400 people when the president of the Texas Academy of Science presented him with a plaque naming him 2006 Distinguished Texas Scientist. Photograph copyright 2006 by Forrest M. Mims III.